This is a brand new Lawrence 705 pickup that will sparkle up many older steels and will also make the new Mullen G2's sound great also. I put two of them in my Mullen G2 and it sounds great to me. 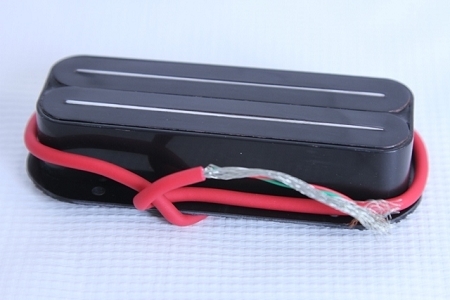 There are a lot of wide mounted steel pickups in guitars. Advance your sound of your steel. Please ask for the wiring directions if you need them. On Sale for a limited time! A wide mount version of this pickup is held in by 2 screws on the left and 2 on the right side of the pickup in a guitar. Order this one if you have 4 screws holding your guitar pickup in your guitar. These pickups really sound great. I requested them to be on my new Mullen G2 and I love the way they sound. Super quiet, strong sound, pleasant tone. Center to center on the 4 holes left to right is 1 7/16"
Center top to bottom on the holes is 2 3/8"
The pickup itself is 3 7/8" x 1 5/16"
and the pickup is from top to bottom 7/8"